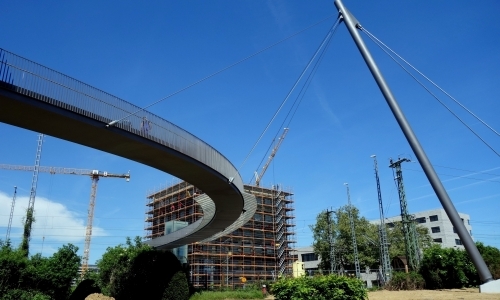 The Campus Bridge establishes the link between the East part and West part of the new Bildungscampus in Heilbronn that is divided by the railway line. The integral bridge structure without sliding bridge bearings is realized by a cable stayed bridge system with a total length of 122 m. The main span at the rail tracks reaches a distance of 77 m.
The bridge, which is curved in plan, reaches a necessary height of 9 meters at the crossing of the railway tracks. It is accessible at both sides by stairways and also by glazed elevator towers. 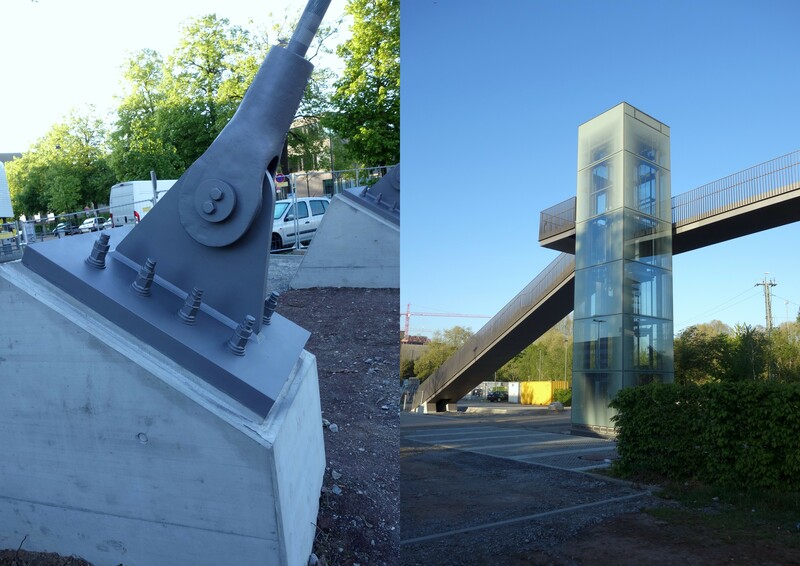 The bridge girder is completely integrated into the stairways. It is formed by a double-compartment steel box girder with a high torsional stiffness. In the area of the railways, the bridge is suspended from an inclined mast with a total height of 31 m by five stay cables. The bridge deck is executed as an orthotropic steel plate with a thin layer coating. Micro piles are used as a deep foundation. The illumination of the bridge deck is realized by a continuous LED-bar integrated into the handrails.